Gear, kit, boats, goodies & gadgets - this section will expand over time with contributions from users - the aim is to give a balanced, objective view on kit that we actually use and like, with reviews written based on people's personal experience of kit they own as well as the occasional "product review" of new gear, kayaks or other kit. These are user's / tester's personal views, not manufacturer's or retailer's "hype" so please read them in that context. E&OE. Your own contribution is very welcome, the only request being that it is made in the spirit mentioned here, and not just used to sell products. Wherever possible, pictures are by the relevant author, but in the interests of decent images, some pictures are copied from retailers website's and credited as such. Unless otherwise noted, prices are at time of writing so inevitably will become out of date. Click a link, or scroll the page. Where relevant, most of the images are clickable to take you to the manufacturers or retailers site or larger versions of the pics. 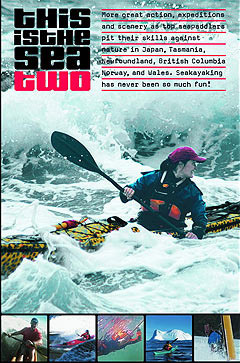 See also the Sea Kayaks section of the Almanac. Tiderace kayaks - various reviews on their website. KCS returned to the market in 2014 with the original trolley which also doubles as a means of loading a boat if you have a van or estate type car, and there is now also a revised version of the original concept which is called the Expedition model. In this incarnation, it deals with everything from rough beaches to smooth surfaces while still packing away in the boat, even for an exped. That said, the massive boulders of the Summer Isles beaches would defeat it, and indeed any trolley. On a day trip, with the wheels, axle and rear support removed it goes in the hatches. Broken down to its component parts it can either go in its bag (supplied) on the deck, or can be secreted in the boat. Travelling to and from the launch, we just put them in the cockpit, fully assembled, with a cockpit cover over the cockpit. That works with a TideRace XcapeX and a glass P&H Capella although smaller boats might struggle without the rear support being removed. That's simple - just loosen the thumb screw and the support lifts out. The Expedition trolley has a wider track and is slightly lower than the originals and is very much less inclined to fall over on a side slope or poor surface as a result. The new fold-up support leg is genius and makes loading the trolley much easier. It's worth noting that due to it's extra width in comparison to the standard version, the Expedition can't be used as a boat loader. Strapping the kayak on is easy. A strap goes round each leg and across the hull to secure the boat to the trolley. There is a pair of line loops on each leg as well, and a strap is taken through these and round the cockpit rim to prevent any tendancy for the boat to slip backwards. The hull support controls any tendancy for the trolley to rotate sideways, as does the additional strap round the cockpit if the surface is very rough. One strap is supplied, but I just use the straps from my J Cradle, which KCS are making again as well. For a short pull on a smooth surface, you can get away with just strapping round the hull. The legs use a thicker material than the originals, and are canted outwards slightly, which controls the old problem of them sometimes bending in towards the centre line. The hull supports however now use a thinner and more flexible material and conform much better to the hull as a result. They can also be removed if necessary, to make packing the trolley in the boat easier. All fittings are very high quality. I've still got my original one, which it is now coming on for 15 years old and is still as good as the day I got it. These things are seriously durable. KCS can also provide spares for older models. A tip though - use Coppaslip or grease on all the metal threads, to prevent corrosion. Another review, by Douglas Wilcox, is here. There are several discussions about trolleys in the sea forum which you'll find linked under the listing Trolleys in the Equipment page of the Almanac. More pictures in this Photobucket slideshow. A full review of the MSR Whisperlite International in comparison with Trangia 25 and 27's running on meths and gas. Click for the article. 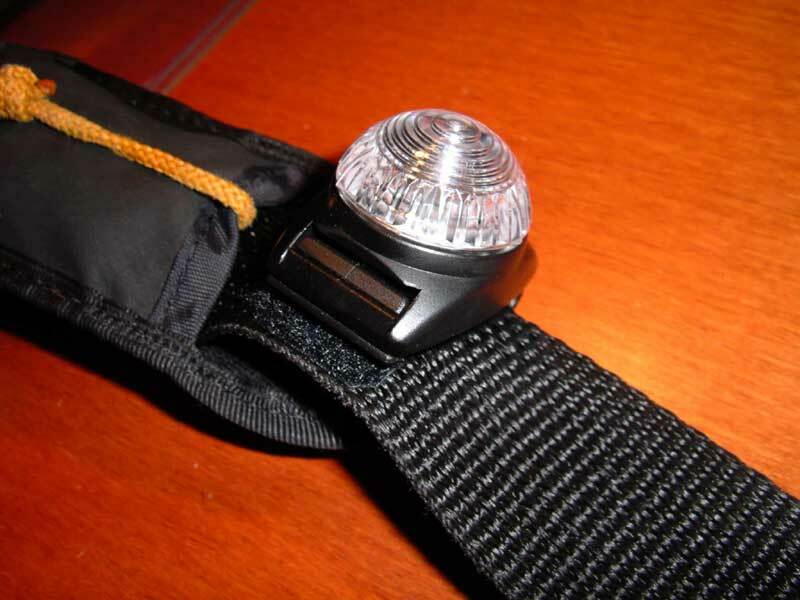 This is a very neat way to carry a strobe or marker light on your BA - it's small, very light and very effective. The makers say "The Guardian is rugged, easy to use and can be seen for over 5 Km / 3.1 Miles. With its dual function of flashing and steady on modes, the Guardian can offer over 250 hours of use on a single battery pack. Whether on a camping trip or racing through the woods on a bike, the Guardian is the one light to have when you must be seen. Waterproof to 300ft and an operational range from -40° to 50° C, the Guardian is available with either belt clip, wrist strap/arm band, swivel clip key chain attachment, or magnetic base." By simply turning the battery over you can choose whether it functions as a strobe or as a marker light although this isn't really practical in day-to-day use and I'd not recommend doing it while afloat! As it's so compact it can easily be mounted on a BA strap, as per the pic on the right. The one I bought came with a clip and I would comment that it's not especially "grippy" so I stuck some heavy duty velcro to the inside of the clip and to the BA's shoulder strap to secure it. A turn of the lens switches it on and they are available in red, green, yellow and blue as well as white. You could have one set up as a strobe and one as a marker light. You could even have port and starboard lights. Prices seem to range from about £10 on eBay to around £14 from the majority of dive shops. The whole question of what to do when you need to "go" in the wilderness is a challenging one! There are many good solutions, depending on where you are, and indeed what you need to do. Accepted wisdom varies from using the inter-tidal zone, certainly for solid waste, to digging a trench on land and then backfilling afterwards. I pulled together some thoughts and suggestions in this article on "Coping in the Wilderness", but here's an interesting alternative. The good folks at Karitek used to sell an American product called "Restop". Now, I've got some reservations about this, but it is certainly worth thinking about and could be a possible solution to a very real and increasing problem. Essentially, the products allow you to safely and hygienically attend to your toilet needs in the outdoors and then remove the results for disposal when back in civilisation. 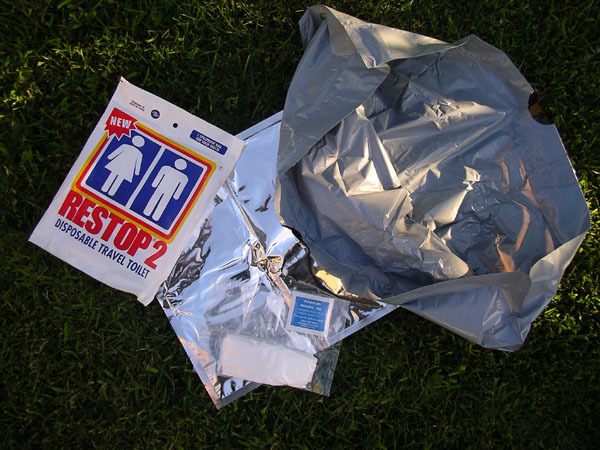 Restop 2 is a mylar bag which the makers say will allow you to capture solid waste, the whole process made easy as it has a wide plastic bag which funnels the deposit into the retaining bag. The whole lot is then pushed back into the bag and sealed. Then, "super absorbent polymers and enzymes" and deodorizers turn the waste to a gel and the bag neatly stores the contents and "contains the odor as well as the waste, providing a user-friendly and pleasant means to pack out solid waste. Ample toilet paper and a moist antiseptic towlette are included." I'm not too sure about the pleasant bit, but it certainly works efficiently and is much better than many of the other "pack out" solutions I've heard about. The makers also sell a commode which essentially turns the whole thing into a conventional toilet. I doubt it will go in a kayak though. Back in our world, the bag can be used without the commode, either by just squatting over it, or by building up a sort of seat using rocks. 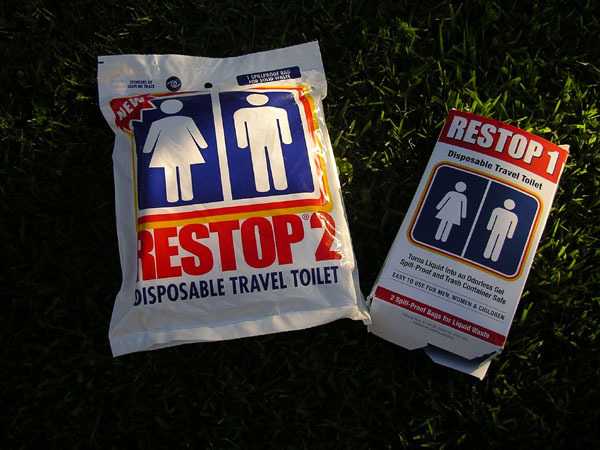 Restop 1 is the same concept, but just for urine. Again, it turns the contents to gel, seals, and is disposed of "in the trash". I'm not too sure about the need for a disposable pee bag, but I suppose it could be helpful in some circumstances. The makers make a big thing about this product being "landfill safe", but a little research tells me that the American definition of that is that the bag and contents won't break down and degrade. The up side of that is the prevention of methane gas production in landfill - the significant downside is that a quantity of mylar, plastic (hard and soft) is then being introduced to the landfill. And won't degrade. Whether that outweighs the environmental impact of human waste being spread around our wild areas is another debate. Overall, in high use, sensitive areas, this product could well have positive benefits and if it were to help people in dealing with what is sometimes a challenging basic function in unfamiliar surroundings, then that's a good thing. Would I rather a dozen of these bags ended up in landfill, or find 12 piles of poo in the beehive cells on the Garvellachs? Yes, I think I would. For people confident and competent with dealing with their toilet needs outdoors, they may be unnecessary. But there are plenty of people who don't know what to do, and this could help them a lot. For commercial operators bringing people inexperienced in the outdoors into wild places, these would be an excellent idea to provide for their client's comfort. These products could also have practical application on long crossings too. Restop doesn't seem to be readily available in UK as of 2016, but alternatives might be the Green Loo and Travel John systems which seem to do essentially the same thing. Restop 2 - for solid waste - ready for use. 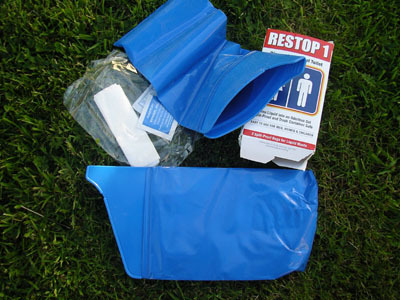 Restop 1 - for urine - two pouches per bag. Shaped profile with a wide opening. Suitable for women as well as men. A compact, contoured deck bag at a decent price - the Seals peaked deck bag fits neatly on the foredeck and provides ready access to those items needed when afloat. The pricing is competitive as well at around the £40 mark. The access flap opens wide and hinges along the bottom so you can get your hand in easily. On top there's a rather weird and convoluted arrangement of bungee cord with a tensioner - I'll be changing that a little, but that's just a personal preference. It's not waterproof of course, but then again, even a fully waterproof bag is going to become damp inside as you'll be putting your wet hands into it to get stuff out! The profile is sleek, and the front runs right down to the deck. Internally there's a plastic shaper to keep it in shape and the construction is good and it's generally a quality item. 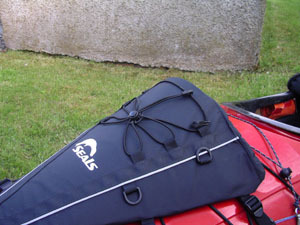 The bag secures to decklines with plastic hooks, and the tensioner straps are long enough to fit a variety of boats. Trimming them with a hot knife will then tidy them up once you've found how much strap you really need. There's a set of additional D rings to attach extra stuff to. 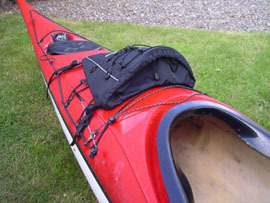 The overall profile is shaped so that the bag doesn't get in the way when paddling, which is more than can be said of the majority of the competition. Well worth considering - An alternative to consider is the North Water version, also a peaked bag with a slightly different design which incorporates mesh pockets on the sides. Nicely shaped profile with a wide opening. 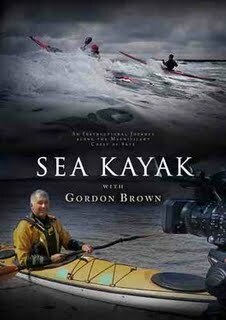 If you enjoy a touch of traditional music, the resonance of a sea cave with a Highland tune being sung in it, and some inspirational photography showing Scotland's superb scenery at it's very best, then this DVD by Gordon Brown, filmed by Simon Willis, is for you. 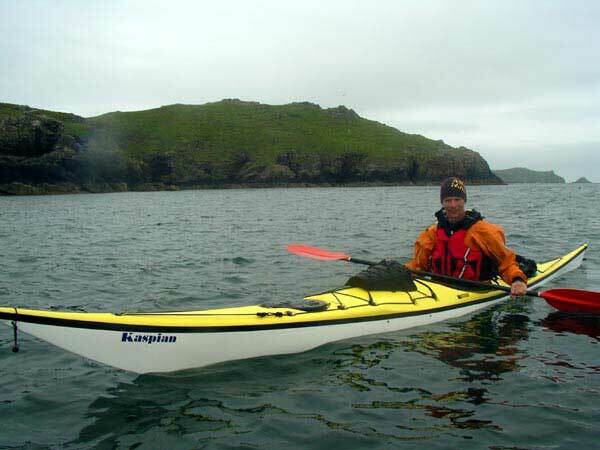 Oh, and you'll learn a wee bit about handling a sea kayak as well! 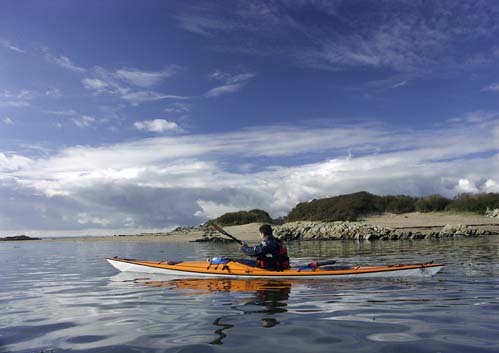 In fact, you'll learn a lot about handling a sea kayak - and you'll learn it against the backdrop of realalistic, real-life conditions where you get to see just what the boat does, what you (your body) is doing and what the paddle is doing (boat / body / blade). Simon's photography and film making skills, combined with Gordon's clear and straightforward teaching style, bring a rich mix of material together in a very watchable format. I guess there were some technical challenges in getting the material used, and if it was challenging, it doesn't show - which is half the trick. Try sitting on a rock with white water crashing around you - that's noisy - yet similar scenes on the video doesn't have intrusive noise, you're still able to hear the explanations of what's happening. Nice. That said, much will depend on your personal learning style - I was left a little frustrated that the superb visuals and excellent descriptions of what was going on were not necessarily matched by the depth of explanation, or "why" things worked or happened. For example, an excellent verbal and visual description of the dynamics of edging didn't include any explanation of "why" edging turns the boat. So, (for me at least) it was an opportunity to overlay some pictorial support material illustrating the changing dynamics of the hull, and that would have helped me in my understanding if I didn't already know. The same is true of "why" you have to lean the boat to cope with tidal paddling - if you've come from a river background, or have sea paddled for a while, you'll hopefully know "why" that is important! Again, an opportunity for a technical explanation supported with static images to satisfy the theoreticians and reflectors amongst us. But I'm being picky - there is much to observe in this video, and even experienced paddlers will pick up some tips - I'd always thought that a stern rudder was just a stern rudder - perhaps I used all four variants intuitively but I'd never categorised them before watching and listening to Gordon describe them. Even the contentious "cross bow rudder" makes an appearance - well, it would, wouldn't it? - and for the first time, I began to gain a greater understanding of it's potential as a practical, everyday stroke. I'll be working on developing mine. Gordon demonstrates fundamentals such as forward paddling in a way which sets a standard to aim for - and may well challenge some people's perceptions of just what makes a good forward paddling stroke. Not being a Level 5 Coach, I don't feel qualifed to comment on the technical aspect of such things - I do know it gave me food for thought, and challenged a few of the perceptions and learned approaches I currently use. So that's all good. Producing a video teaching tool to teach a highly experiential and complex skill is a challenge - and a challenge I've always been highly dubious could be undertaken sucessfully. But it has been. Given that it's going to be challenging to take the video out on a boat in order to mirror the skills, it's still a very good tool to use in setting some of those skills in your mental map to work on replicating them on the water. Well worth buying - both for the skills tuition, the scenery, and some fascinating wee snippets of history about a coastline which is itself worth a visit. It's not for the complete beginner it has to be said, largely because it assumes a degree of kayaking abilty, but for the intermedidate / improver, it's a great way to learn. And the singing? Well, I rather liked it. See also this discussion for more views and reviews. It's £19.95 - want to buy? Click here. I know nothing about the technicalities of marine VHF, or marine electronics - but I do know this is a very nice bit of kit. It's solid, appears to be very reliable and well made and has superb battery life. Icom is the handheld radio of choice for CG and many rescue services so that's good enough for me. Icom's tech spec on this radio says it "provides advanced waterproof protection to 1.5m depth for 30 minutes, equivalent to IPX8 rating, a first for the market place" and it certainly seems to be able to withstand being immersed. The IC-M71 comes with a 2000mAh Lithium-Ion battery pack, that Icom say provides up to 15-16 hours operating time on the standard 5:5:90 duty cycle *. It doesn't have the facility to use normal AA type batteries as back-up **, but the battery life appears more than adequate and was still showing almost full after a weeks trip where it was on all day to get MSI and used for routine calls to CG every day. It charges in about 12 hours either from the mains or from the car if you have the optional 12v adaptor lead for the oe charging cradle. A fast (4 hours) charger is available, as are various other extras like a remote mic - see the brochure. For comparison, my previous radio (a Garmin 725) was quite capable of virtually depleting it's battery after only a day of similar use. With 6 watts of transmission power (most are only 5 watts ***), it also has a "mid" setting at 3 watt and a "low power" mode at 1 watt. It can be set to automatically go to standby to save power while it's not in use. All this helps battery life. In use it's excellent, and has successfully transmitted and received in marginal areas when other makes haven't been able to. The screen is backlit and easy to read. The ergonomics are good and it fits neatly into the electronics pouch of my BA. Icom give the dimensions as: 52.5(W)×125(H)×30(D) - but with the antenna and belt clip it's really 52.5(W)x240(H)x45(D) mms. Weight is quoted as 280g (with battery and antenna). UK versions come with INT (which we use) and US frequencies. For some reason, the CAN (Canadian) frequencies aren't supported on the UK spec radios. Going to BC? Taking your radio? There is one other annoying "feature" to be aware of and that is that even when the keypad is "locked", if the radio is set to dual or tri-watch function that will be cancelled if the transmit key is pressed. This can be fixed and Icom's customer service really is superb - mine had this issue when I got it last year, and when I returned the radio to them they reprogrammed it free of charge. See this discussion for more details. It is still possible to accidentally switch between power settings even when locked, again something to be aware of. 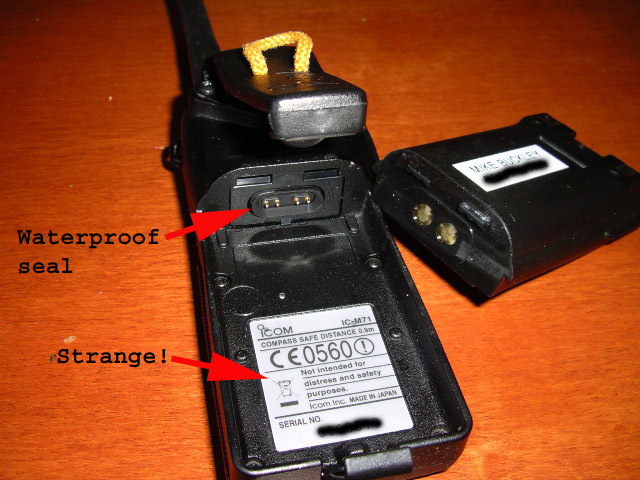 The radio itself is waterproof - the waterproof seal for the battery to radio interface is between the connector terminals at the top of the battery compartment, and the body of the radio. This makes it a good idea to remove the battery after a trip and remove any water which may have got in. My only dislike is the lack of a visual indication of volume on the screen - the rotary on/off/vol control isn't something I like that much as it's easy to turn the vol down as the knob rotates very easily and it's hard to see where it is set. A touch of paint gives me a visual marker, which helps. It has a lot of programmable settings and functions, so it helps to keep the manual handy - - and familiarise yourself with what buttons do what, depending on how long you've pressed them and in what combinations. That said, basic operation is very simple and logical and sound quality is good too. A minor mod I made to it was to drill the belt clip to take a loop of cord as a lanyard attachment point in place of the wrist loop it comes with. The belt clip can be removed (it's quite bulky) and something like a loop of thin dyneema cord through the built in attachment point would do the job too. Since the article was written I've done just this and it does make the set much more compact. Retail prices seem to range from about £210 to just over £160 at time of writing so it's really worth searching around a bit. They often come up secondhand on eBay and can be got for around £100, often either new or almost so. Which is how I got mine. * The standard worldwide radio user application is referred to as a 5-5-90 Duty Cycle. This means users transmit (talk) 5% of the time, receive (listen) 5% of the time and are "on standby" 90% of the time (the radio's switched on - but no one is transmitting or receiving) over an 8 hour period. 5% Transmit = 24 minutes of transmission during an 8 hour period. 5% Receive = 24 minutes of receive during an 8 hour period. 90% Standby = 7 hours & 12 minutes of standby during an 8 hour period. ** Many sets transmit at reduced power when used with battery trays. *** Power output is not the only factor in whether one radio will transmit better than another - I understand that antenna efficiency also plays a part. Minor mod - a lanyard attachment point on the belt clip. Battery removed - the waterproof connnector seal is visible at the top of the compartment. Note the wording in the radio - "Not intended for distress and safety purposes". How strange. I suppose that's just Icom covering their backs. Note: These radios (as with all marine electronics) require a degree of care and it's good practice to wash them in fresh water after use. Be especially vigilant as some of the screws and metal parts are susceptible to salt-water corrosion. It appears that a number of people have found that the centre charging terminal corrodes away, leaving it impossible to charge the battery. The only solution seems to be to replace the battery at a cost of nearly £60 a time. 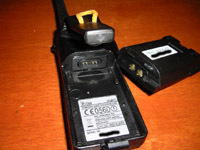 Icom state the battery is a "consumable item" and refuse to replace it under warranty. The IC-M71 as reviewed here doesn't seem to suffer the same problems as the battery has only two charging terminals. The latest version of this set is the M73 - while Icom generally have a great reputation, my partner had some problems with the M73 she got as a Christmas present in 2014. See this discussion, and also this discussion which is linked from it. 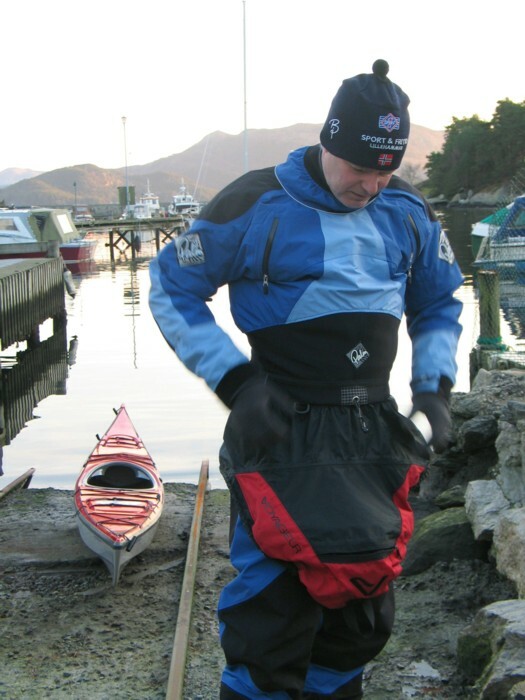 The Kokatat Expedition drysuit in Goretex is quite simply a fantastic suit, but at the price it should be! That said, you do get what you pay for and with this suit you get functionality, the very best of material (Evolution 3.2oz Nylon 3 layer Gore-Tex¨ Immersion¨ Technology) and excellent build quality. Part of the price comes from the zippers which are proper metal tooth, waterproof Optiseal zippers. And they work very well indeed. I've spent several hours in the water helping a pal with her rolling techniques and was totally dry afterwards. It was rather nice to put the suit on over my day clothes - swim around for a few hours - then just take the suit off and get in the car and drive home with dry clothes. Entry is via a diagonal front zip, so you can get it on and off or your own - with a bit of practice. Kokatat advise - "left arm, right arm and then put your head through the neck seal". It also helps to pull the suit up your body as much as possible before trying to put your right arm into the sleeve - or remove it! Had I known that when I first got it, I'd not have been trapped in it for 10 mins until I worked it out! It comes with a relief zip. Well worth having! For women, a "drop seat" option is available instead of the relief zip but I gather Kokatat refuse to provide this option for men for some reason. Put beeswax on the zips - it helps them slide better. Knees and seat are protected with Cordura patches and the overall cut allows easy movement without restriction to paddling action. The hood can be rolled away when not needed. Neck and wrist seals are latex, the wrist ones also having neoprene overcuffs. All the seals on my suit are comfortable and not too tight. Unlike my cag, which still hurts my wrists a little! It comes with Goretex socks which (so far) have been fine - I do suggest wearing Mukluks or booties to protect them though and certainly not something like sandals - the slightest damage from a thorn or rock would puncture the material and whatever you do, avoid walking around without the socks being protected as any damage so caused would potentially fall outwith any warranty claim! I detest latex socks and don't like latex ankle seals so the Goretex socks seem like a reasonable compromise. Wearing ordinary socks will help protect the material from wear or damage from toenails. It's fitted with velcro straps to snug the ankles. The waist has a simple bungee drawcord to snug it in and this seems to work well although I initially thought it would be good to have internal braces. As a kayaking specific suit it comes with an adjustable double waist band so you can seal in nicely. The sleeve pockets have lash tabs and salt water doesn't seem to harm the zips. Kokatat sizing is on the generous side, so if you need a large suit then this is certainly one to consider. Despite being 6'2", 48 in chest and not especially slim, I can wear the XL size with room to spare and they go up to XXL. Kokatat say they can do some minor customisation and will increase or decrease the length of the arms, legs, torso (above the waist) or rise (waist to crotch) on most of their dry suit models for a nominal charge. They can't build or alter a suit to a list of body measurements. Talk to the retailer and ask for a "sizing suit". It's comfortable to wear and the Goretex works very well. That said, as much of you will be covered by non-breathable kit like a BA it's inevitable that you're going to get a little damp around the chest area from perspiration. As with all such suits. That said, the fabric's breathability seems far superior to the Palm Aleutian cag and Sidewinder combination I also now use. All good things come at a price, and if you want what is arguably amongst the best then this suit is worth considering. Any downsides? Apart from the price, no. It's a fantastic bit of kit. Since I got mine last year the hood is now made from Paclite which will allow it to roll away more neatly than mine but I personally prefer the original design which is well cut, allows you to see to the side and works well. I doubt you'd be able to wear a helmet under it though. Barra - August 2008 - wet, cold and windy. The Expedition kept me snug. Yes, I did say August - this discussion on suitable clothing for the Scottish summer suggests it can be a fickle thing. Mull at Whit w/end 2009 was similar! An excellent bit of kit, extremely well made and very comfortable to wear. Although it's marketed as a "female specific" BA it is unisex and I find it a good fit. The adjustable shoulder straps and 3 straps on each side allow it to be adjusted nicely to cope with a range of torso lengths and waist sizes. The sides are elasticated mesh so allowing plenty of movement. The arm holes are nicely cut and quite low. Two side bellows pockets provide enough room for a small camera, snacks or some basic things you might want to keep handy, and the electronics pocket is ideally placed to carry a VHF or a GPS. Some folk feel the pockets should be bigger - why? Then you'll just carry more stuff which, on a BA, may not be all that good an idea! 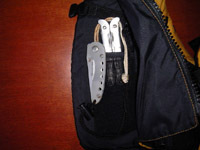 There's a clever internal pouch located behind the front zip which could carry a small flare - I use it for a multitool and a knife. One of my pals carries his VHF there rather than in the external pocket. Two fastex buckles secure the main body of the BA so the zip can be opened to access it - or indeed to provide some ventilation on a hot day. 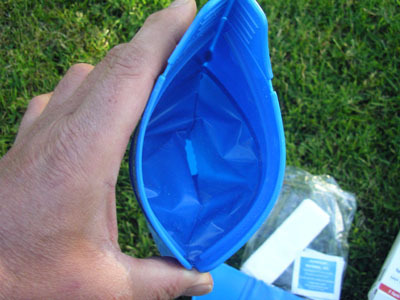 Kokatat also offer a hydration pouch or pocket which can be attached to the back. All the pockets have handy lash tabs and the zippers seem to resist the corrosive effects of salt water. A superb bit of kit overall and I can't find anything to fault it - apart from the fact that the zip is "sided" for females. You get used to that. If you want to be able to colour co-ordinate your gear, then Kokatat make most of their gear in matching colours. Finally - and most importantly - yes, it seems to provide plenty of bouyancy and it's easy to swim in! Lots of room for loads of stuff. Internal pouch located behind the front zip. This is an interesting concept - a geodesic tent utilising what Vaude call "Powerframe technology". In essence, they've replaced the "hook and bungee" system used in their other external-frame tents with a system of clips to attach the tent to the aluminium poles. 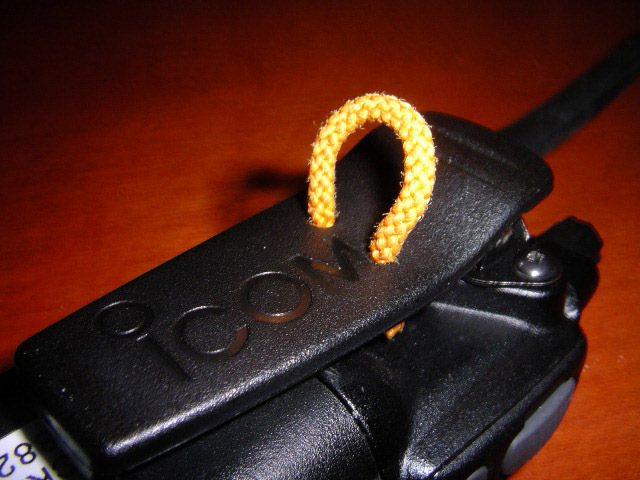 This seems broadly similar to the system used by Hilleberg, but these clips have an additional locking portion which locks them to the pole. They claim that "the geodesic construction and the specially designed clips enable bombproof stability in stormy regions". The Power Atreus is one of a number of new models using this system. It's easy to put up, but not as quick to pitch on your own as the hook and bungee system used on some other models. Mike Buckley, August 2009 - last revised April 2010. I've been a fan of Vaude tents for a long time, so when my 10 year old Mk II LE got badly damaged on Barra in 2008 and needed to be replaced, the logical conclusion was to buy another one. That said, it wasn't an easy decision, and I got a lot of advice from the Sea & Surf Forum with all sorts of alternative suggestions from the sublime to the totally impractical. Vaude pioneered a cunning system whereby the poles attach to the tent using a system of hooks and bungee cord - it works extremely well and as the inner is attached to the fly, the whole tent can be pitched very quickly and the inner stays dry if it's raining. It's also very easy to do it single handed. No threading poles through sleeves, or trying to drape a fly over the poles - a horrible job in wet, windy conditions on your own. The entire pole set is bungee'd together as well, which is an excellent idea. At last we've caught up with what the Canadians were all wearing 5 years ago! Various retailers have started importing a variety of high-calf paddling boots, but made from waterproof neoprene. With Easter coming up, I bought a pair of these in 2006 (£60) and having tested them on the Solway thanks to an unexpected swim, I can report that they are comfy, warm and waterproof! They are significantly more flexible than a traditional welly boot, and a lot more comfortable to wear in the boat as well as being warmer. Although they have a sole that is much thicker than a traditional wet-bootie, they aren't quite as thick as an ordinary welly boot but are still ok for walking over rocks and the like for a shortish distance. Whether you'd want to walk any significant distance in them is another matter as they aren't especially supportive. Far better than wet-booties though. The velcro strap across the top of your foot holds them nice and snug, and the adjustable calf strap clinches up tight enough to stop water flooding in if you're in water above the top of the boots. Some water will get in though. Overall, I like them. Quite whether they are a substitute for a well fitting pair of ordinary wellies and a pair of warm socks is something you must decide for yourself. They are very good to wear with a dry suit though. Sizing can be a bit hit 'n miss so you're better to try them on rather than rely on your normal shoe size. 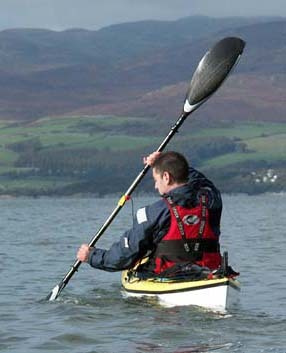 Rapid Kayaks are selling the latest version for £84.95 (as at Nov 2011) under the name "Boundary Shoe". If you've got big feet and have trouble getting into a boat while wearing wellies, do check that you'll be able to get in wearing these as the sole is fairly chunky. By way of example, my size 11's will slot into my Quest if I'm wearing Hunter wellies which have fairly small heels. I can still get in wearing the Mukluks - just. I also use Hunter Wellingtons as paddling footwear - not cheap in comparison to a pair of gardening wellies from your local DIY store, but they fit much better (less water space inside!) and last forever. They have a small(ish) heel which helps if space in the boat is tight and are supportive enough to walk a reasonable distance in. The sole is good and they are exceptionally comfy for what they are. Cut the metal cinch strap off unless you need it - it tends to catch on cockpit rims and doesn't do them much good. RRP for Hunters is around £60 and you should get them for much less. They are also good for gardening - I'm told. Having watched it twice in two days, all I can say is that it's blown me away. It has something for everyone - from the ordinary paddler wanting to get an insight into paddling conditions in locations they may not normally paddle in, to the white water paddler looking for an insight to the sea paddler's mentality and that's not to forget the paddler looking for inspiration for a couple of major expeditions. Watching an 18ft sea boat being surfed in 18knt flows in Skookum in British Columbia is mind blowing. And not just held on the wave, but rolled, pirouetted, twirled and anything else you can think of. The big waters off Wales certainly offer some significant fun too, and the section where a mixed bag of paddlers from sea and white water backgrounds go out to play just proves beyond a shadow of a doubt that sea boating is certainly not the wimp option many white water paddlers may think it is. But it's not all action and fast water - there are moments of gentle reflection, moments where the unique experience of being at one with your chosen environment and at peace with the world are extremely obvious. Justine brings a novel perspective as well - while she's clearly an extremely competent paddler, she doesn't come across as a hard-girl, know-it-all, macho guru, just as an ordinary person who is doing some extraordinary things with a sea kayak. We get to see how hard it is to battle a head-wind, share her fear as she and her companions face some seriously big and scary conditions while paddling round Tasmania and get an insight into the sheer joy of achieving what they achieved by doing so. And how many of us get to paddle round Japan? The camera work is astonishing - you are in the boat with her - being a cynic, I kept looking for the support boat with the camera crew but there isn't one! All the photo work was done from the kayaks using some seriously fancy boat mounted video equipment. By way of comparison, I've just finished reading the story of a couple of guys who rode round the world on motorcycles - (well, as far as you can taking into account the significant bodies of water to be crossed). That's an amazing and exciting story in itself, but it's necessary to understand that they had a significant support crew with them. While not in any way denigrating what they achieved, they had access to vehicles, local fixers and satellite phones if needed. While going round Tassie may not be on the same scale, one cannot help but wonder whether the combination of the difficulty, remoteness and sheer self reliance doesn't make it a more significant challenge. Not least because it was just Justine and her two companions. No support, no land crew, no rescue's from a handy RIB. If you've not seen "This is The Sea 2", you need to. It's 90 mins of superb viewing, inspirational, moving and wonderfully put together. It may well turn out to be one of sea-kayaking's classics. As indeed the original "This is The Sea" has already become. Oh, and there's hardly a beard in sight. And no evidence of boiled sea-gull either. A great Christmas present. No. Forget that, it's a "must have", irrespective of whether its a present, Christmas or otherwise. Clicking the pic or here will take you to Cackle TV where you can buy, and most of the decent retailers will have it too. Take a look at the Epic range (Knoydart have them) - I've just been trying some and am very impressed indeed. Nice and light, good to hold, and a very dynamic feel in the water. I'm a big fan of Lendals, and my much loved big Nordkapp blades (N12) on their cranked fibreglass shaft served me well for years. The Epics are looking like a serious competitor however! They come either as a one piece shaft, or with a variable centre joint (for feather and up to 10cms length) which while not as neat as the Lendal PaddLok system, does allow you to adjust and set length and feather without having to use a key. That said, they also provide a thing that looks a bit like a large "Y" spanner to help tighten or loosen the joint if needed. I didn't need to use it. The overall quality is excellent and both the shaft and the blades are nicely finished and they seem very well made. Interestingly, the shaft is ovalled on both sides, so the paddle can be set up using the variable joint for either left or right handers, and it falls nicely into a natural paddling position. The other very interesting thing was that although they are straight shafts (and I'm now used to a crank), I found them flutter-free and was able to paddle with a very relaxed, open grip. Not being constrained by the position of a crank, you can also move your grip much more easily. On the subject of grip, I found the shaft fine for my big hands, and a lady of somewhat diminutive build was equally happy with them as was her somewhat larger partner. Both liked them as well. Entry and exit was smooth and controlled, and I did everything with them with ease and comfort. Except roll. It was a cold day, so I didn't! Kayaking is, after all, a dry sport. There is an immediate cost and weight difference between my fibreglass shafted N12 bladed Nordkapp and the Epics of course, so I'm not comparing like with like. However, having also tried a very light hi-spec Lendal of roughly equivalent blade size / area, the Kenetic, the Epic still had me hooked and the prices compare favourable. Epic offer a range of models - and constructions. I've been using the "Relaxed Touring" and the "Activ Touring". With the "green hybrid" shaft (a combo of fibreglass and carbon) and "standard hybrid blades" (fibreglass face, carbon fibre rear and with a foam spine) these are lovely to use. It would be hard to make an objective comparison between the two styles - the Activ looks like what we expect the standard "Euro blade" to look like. The Relaxed appears thinner and longer - not quite an Inuit paddle, but certainly different to anything I've used before. The tech info says it's "best suited to a low angle paddling style or those who want a less tiring paddle". Personally I liked it, it seemed to have plenty of power and I found myself choosing it over the Activ. Which is strange, given it's a somewhat different paddle to my Nordkapp in terms of blade shape and concept. Interesting. I was worried that what seemed like a narrow blade wouldn't give me support when I needed it, or would restrict my ability to add power when necessary. Not an issue, plenty of both. A session paddling into a stiffish head-wind proved somewhat less tiring than it would have been on my normal blades and I stayed with the rest of the group! I've also tried the top-of-the-range "signature series" blade - this has a full width foam core and a much smoother, rib-less back. Now that thing virtually jumps out of the water on its own. Mind you, the price reflects that so I'd expect it to, and I'd expect it to make the coffee as well, and put my tent up for me. Very nice though. Prices range from a reasonable £147 for a 1 piece shaft with "standard hybrid" blades (£183 as tested, with the 2 piece option) to £345 for the full carbon fibre shaft, 2 piece option and ultra carbon blades. Weights are based on a 210 cm 2 piece Length Lock paddle but vary between 840 g and 615 g depending on specification. So they're light then. Well worth looking at in my opinion. Mine's on order. Knoydart say: "This blade makes a great all around paddle for smooth, efficient, powerful strokes. It’s also a good open water racing blade for those who don’t want to use wing paddles. Standard is a 2-piece fitted with a Length Lock centre joint - This allows up to 10cm length adjustment and feather can be set to any angle, right or left control." Knoydart say: "The Relaxed Touring blade is best suited to a low angle paddling style or those who want a less tiring paddle. 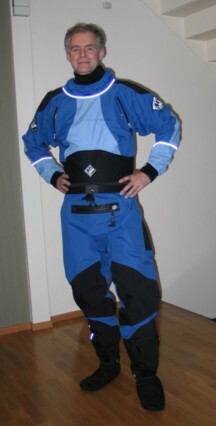 I have been asked to write a review of my new Palm Sidewinder Torrent drysuit. I will give it my best shot, but please keep in mind that this is the only drysuit I have ever tried, and that I write these words after using it only once. To top it off, I did not swim in it. First, when examining the garment at home, I understand why a drysuit like this one comes at a price. It must have taken many hours to produce it, with its many sealed seams, intricate details and the use of different materials. As far as I can tell, the materials are of very high quality, whether it is the waterproof zippers, the three-layer breathable fabric, the neoprene parts or the latex neck and wrist seals. The seals, by the way, are safely hidden underneath velcro adjustable protectors. Cordura fabric is used on wear areas like the bum, knees, shoulders and elbows. The craftsmanship is simply outstanding. The suit has rear entry and is very easy to get into, and the leaflet contained some useful hints about how to pass the seal over the head without ripping it. The only worrying bit was that when opening the zipper for the first time, it was very, very tight. Greasing it with the silicone grease provided made it a lot easier to pull, but I still have problems closing it by myself. I will have to apply some more grease and see how it goes. As the air temperature was only 2 above freezing on the day of the test, and the water temperature not significantly higher, I wore two woolen long-johns, an HH Lifa base layer sweater and two woolen sweaters. I am quite pleased with the fit (I am 6'2" with a 34" waist and got an XL size). Before getting in the kayak I did feel that the suit did not have to be so generously sized around the legs though, but once aboard it did not matter. The suit comes with sewn-on socks or booties, and I have split feelings about these. They have a written warning on them, cautioning the user to wear protective footwear. I improvised by using an old pair of sandals, but I still feel the socks are the suit’s Achilles' heel. If I ever wear or tear a hole in my suit, this is where it will happen. And even if I tighten the suit around the ankles with the velcro adjuster, it will not be watertight as a latex seal. On the other hand, with thick woolen socks underneath, it was nice being able to walk into the freezing cold water and still feel warm and dry. One of the details I appreciated when stepping into the sprayskirt, was the wide neoprene waist belt that fitted over the sprayskirt's tube. My thoughts went to the Eskimos who had their jackets sewn into the skins of their kayaks. Once on the sea, I felt very secure. The suit was really a self-confidence booster. Like mentioned, my feet had not felt cold at all when wading, yet when my cotton gloved hands got wet my fingers numbed almost instantly. With proper gloves, I should be able to stay operative for quite some time after a capsize. When starting to paddle I could feel the stiff zipper on my back, but quickly forgot about it. There are no underarm seams, again proof of great care about details. What I did not so easily forget, was that I was overheating even when paddling below my normal speed. I had kind of expected that – I am used to dressing for winter activities like cross-country skiing and will normally wear considerably less than I did now. But you are supposed to dress for the sea temperature, not the air temperature, right? Another thing was the BA I was wearing over the suit, which effectively sabotaged the suit’s breathing capability, resulting in a very sweaty back. Perhaps I can safely rely on the suit alone, but I really feel better when wearing the BA as well, so I guess I just have to live with it. My arms felt dry though. When rinsing the suit in the bathtub après-paddling, the socks again made me think. Without them I would just have flushed the inside of the suit and hang it to dry. As it is, I will have to turn the legs inside out to make sure no water is hiding in the socks after the outside is dry. To sum it up at long last; I am very happy with the Palm Sidewinder, and I am sure it will serve me well for years to come. The wife already wants one. Oh, one last thing: I had planned on storing it hanging in a cupboard in the laundry room. This will not happen though, as I was reminded that rubber should not be stored in the same room as electric motors. They generate ozone that will age rubber quite efficiently, ask any tyre guy. Consider yourself warned, the leaflet does not mention this. (Click here to see what Google finds. Interesting). 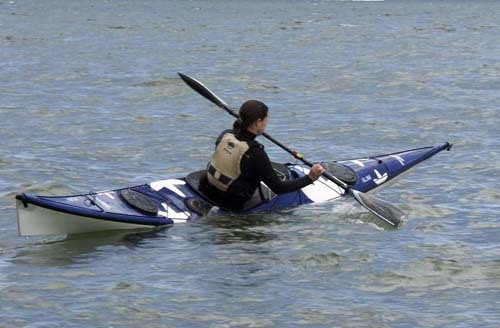 Shoreham Sea Kayaks are a new entry in the burgeoning UK sea kayak market, based – as the name suggests - on the Sussex coast. Their boats are constructed in Europe specifically for the company and their range includes three different hull designs with many optional variations. SSK aim to provide boats of high quality build and performance but – and here is their marketing ‘hook’ – to offer them at prices significantly below the established competitors. We were supplied two of their designs to test; the Kaspian SK18 and Kaspian HV17. The internet knows everything, so we Googled ‘Kaspian’. It turns out that the word means either a Central Asian sea, or a character in the ‘Narnia’ children’s books. Whatever. What we know for sure, is that the SK18 is designed as an out-and-out expedition boat to handle any conditions and get you from A to B fast, whilst the HV17 is also designed as a fast boat, only with much more volume and stability. A first glance reveals that the two boats are very different beasts. The SK18 is narrow and sleek and has graceful curve along its length. The back deck is a little lower than the front. The hull tapers to a thinly pointed bow which scores lots of points for aesthetics, whilst the hull narrows right down towards the stern. A retractable skeg offers directional stability and extra waterline length when needed. Two random passers-by asked if it was a ‘Nordkapp’ and although there are definite differences, the SK18 shares the appealing Inuit lines of this classic boat. By comparison, the HV17 looks far more functional and utilitarian. Although it is only 3 cm wider than its partner, it clearly has far more volume as the greater width is maintained along its length. It has a ramrod-straight hull profile with hardly any rocker (curve). This is extended as far forward and back as possible, to give a very long waterline, despite the HV17’s shorter overall length. At the stern this forms the equivalent of a fixed skeg. The bow still curves upward with some style and dignity, the HV17 isn’t ugly! The HV17 comes with a retractable rudder fitted as standard. Read more . . . .
Got a birthday coming up? This IS the one to get or ask for!! What have we got? A beautifully presented book, printed on high quality paper, with excellent photos. The reports are a good combination of factual reporting of each trip, nicely mixed with enough local colour and information to add value and interest to each one. The various trips are graded according to severity, and distances and likely timings are included as well. What else? Interspersed through it are little snippets of info - a story of being caught in a gale; info about seals and otters; gannets and surf landings. Makes what would otherwise just be another guidebook (albeit a very good one) into a much more interesting read. The Appendicies contain some good stuff, including some planning tools, and a usefull glossary of Gaelic words. 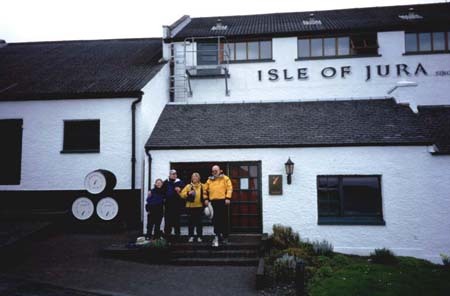 The routes run clockwise from the Mull of Galloway right round to St Abbs Head, taking in some well-known classics like the Garvellachs and some perhaps more challenging routes like Cape Wrath. It's by no means an exhaustive summary of every possible sea trip and there are still lots of "hidden jewels" waiting to be discovered (or for others to find, if you have your own "special, secret" places). 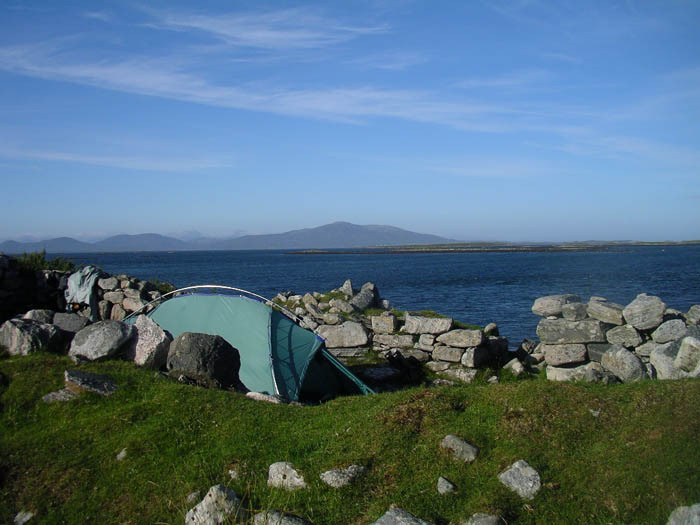 The authors have included general info on suitable camping places on the longer trips - personally I'd have prefered this not to be inlcuded, but it is helpful I suppose. Any negatives? Well, it's such a lovely book that I may have to buy another copy as a "working copy" . Some of the routes are potentially exposed and although the authors do draw attention to that, it's perhaps worth remembering, especially if the area is new to you. 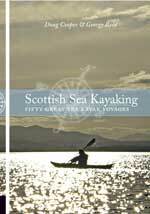 Summary - if you paddle (or want to paddle) Scottish waters, this is one to have! Pesda Press have stock for immediate delivery, or Amazon or your local bookseller. £20 or so well spent. 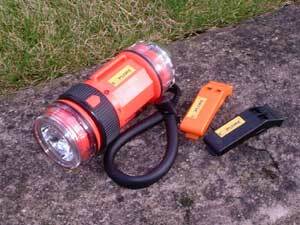 I've just got a new strobe - this is an interesting idea - this unit combines a strobe and an LED torch, so two important safety items are combined into one. Runs on 3 x AA batteries and the box says it's waterproof to 40 meters and the strobe is said to be visible up to 5km on land and 25km from air to surface. Not having been able to test that, I can't comment but it does work well as far as I can see. The one I have comes with a cord and slider which seems to be intended to attach to your wrist. By modifying a velcro strap a little, I was able to mount it on my BA shoulder straps using the slots on the side. It seems a solid bit of kit and if you are prepared to trade off the fact that it's a little bulky at 14 x 5cm (and fairly heavy ) against the benefit of combining two bits of kit into one, it would be worth considering. In "torch mode", it's adequate for general use but the beam is more flood than throw. It's made by Xenec and seems to be fairly readily available from diving shops and eBay. Be careful, as there are similar versions which only have an ordinary bulb in the torch - they are a bit cheaper though. The whistles are seriously loud, available in black or orange and can either be tied or clipped to a BA strap. Everyone should have one of these. I bought this just before Easter 2004 - this cag is wonderful - superbly made and solidly constructed, everything is there for a reason and it's functional and practical. It has all the usual stuff like latex cuffs, adjustable over-cuffs, reflective strips on the hood and sleeves and a couple of practical pockets on the sleeves, one of which has a key lanyard attachment. The material is soft and quiet, XCR Goretex, and it works! Very well! A hand-warmer would be nice though. There is a good double waist seal, and an ample and practical hood which can be rolled and secured with a velcro tab. The neck opens nice and wide so you get good ventilation, and the collar has a soft rubber lining. There's a good neck gusset which keeps you dry and a mandarin collar so you can seal in well without having to have the hood up. I got an XXL which is generously sized (I'm a 48in chest) for me, but the cut is good and I've more than enough room for fleecy things underneath. Down side? It's such a good cag that it's really a little too warm for summer use, but if you want to stay dry in foul, cold conditions it's one to have. The latex cuffs are a bit on the tight side to start with, but are loosening up as time goes by. 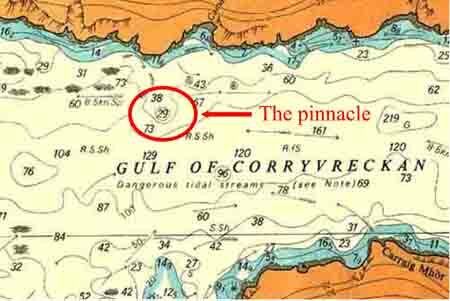 On our Easter 2004 Jura trip we had some seriously nasty conditions coming back, but this cag just "did the job" and I arrived back on land warm and dry, which I would not have been in the cag it replaced. I finally retired this cag in 2010 as it had almost worn thro in places and was leaking a little. That said, it was still on it's original wrist seals. I replaced it with a Palm Aleution which is a nice cag, somewhat cheaper and well made, but nothing like as breathable and really too warm for the summer. In 2011 I bit the bullet and bought another TecTour! A great all-rounder and recommended. Talk to Sea Kayak Oban for one. Update: June 2015. The later cag was actuallyworn through in several places (mainly the sleeves, along the seam lines) by June 2015, despite relatvely light use over the period I've had it. It was returned to SystemX who provided excellent service and patched it, but it would seem that the material isn't as hard-wearing as the original. Update - September 2005: There is now also a version in a material called "Tropos", at a more economic price. This from Niall Duncanson from a post on the Forum. "I went through the same thought process as this (Ed. Debate on XCR v Tropos) in May, and ended up with the Tec Tour in Tropos. I couldn't quite bring myself to spend £250 on the XCR version, so Tropos was a good compromise. Overall build quality is excellent, all the features make sense and work properly, and I am very pleased with it. The XL is just loose enough on me that I can easily don it when afloat in calm(ish) water - although I usually wear it anyway when relevant. The cut is obviously well thought out for paddling and restricts nothing, but without seeming baggy or catching on things. The hood is an especial strong point, being very effective and adjustable, and moving with your head when well adjusted. When not in use it lies out of the way on your back, as when rolled away it felt more restrictive. The collar and zip is also very good at keeping spray out of your face when the gods start to play, but fold away like lapels when not in use. The 'adjustable neck seal' is made of soft rubbery material which did not abrade my fairly sensitive neck over 4 days on salt water, which was surprising. When done up tight it is fairly uncomfortable, but a reasonably fast roll will result in only a spoonful of water coming in. When left open it is a very effective vent, opening nearly as far as my sternum. The wrist gaskets and overseals are simple and effective, although all rubber gaskets are painfully tight to begin with. The double waist seal is more soft rubber with drawcords, not designed to provide a tight seal like a ww drycag is, but is effective enough that more water will come in your neck than waist. Tropos is a flexible and surprisingly light, 2 layer breathable material, the membrane being the white inner layer. This means that the membrane is exposed to abrasion from your inner layer clothing, and will probably fail due to this, eventually. XCR goretex is trilaminate, with a bonded liner to prevent this, and is therefore much more durable than 2 layer. Tropos appears to be fairly breathable, and still fully waterproof after 4 months (it should be!) including full arm immersion in a high brace. Overall it was a great buy, although I haven't had it long enough to tell how it will last. I will replace it with the XCR version if I wear it out. My reccomendation is to buy Tropos unless you can justify the XCR, which is likely to last much longer if used heavily. Hope this helps. Niall Duncanson"
I've just got one of these, as a lighter cag than my Kokatat. This is certainly a beautifully made cag! The detailing is superb, even down to the draw cords for the hood having neat little retaining tags to keep them from slapping into your face in the wind. It has all the usual stuff like latex cuffs, adjustable over-cuffs, reflective piping and a couple of chest pockets and a front pocket. The material is soft and quiet, not Goretex but what seems to be a good alternative breathable fabric called XP70. It seems like super breathable hardwearing stuff. There is a natty fleece lined handwarmer pocket which I like a lot - and you have the option of removing the fleece if you want to. If you have big hands, you might want to as I find the fleece tube is a little too tight for me. I like it as a medium weight, breathable cag - the double waist seal works well (it has some form of super-grippy stuff instead of a draw cord) and it fits me well. (Size XXL is a good fit for me at 48in chest). The hood also folds away well, with a neat closure system to keep it out of the way. What else? The neck zip opens nicely. The zip is baffled and should keep the water out in big seas when the hood is up, but there's no gusset when the zip is open. It would be better if it had a mandarin collar so you could seal the neck when necessary, without having to use the hood. Makes for good ventilation though. Other than that, a really nice cag. It's readily available from the usual suspects for about £149 (Oct 04). See here for info from Palm's site. I was able to get my hands on these beauties - I have used it 2 days on the Solway, 2 on the Clyde and 1 on Loch Moidart/Sound of Arisaig, all calm unfortunately. My first impression is what an effortless paddle it is to use all day, it seems to encourage good paddling technique. I found some manoeuvring strokes and high bracing, if you need to sweep the trailing edge forward difficult. It has also been used by beginners, 4*, 5* and 4*coaches. Apart from one 4* paddler, all loved it. I've been fortunate enough to spend a fabulous day with these down on the Solway. The top picture is of the K1RS, this is the "detuned" expedition model but I found it fast and responsive to edging with amazing secondary stability. Very comfortable straight legged position aided powerful power transfer through the feet. In lightish winds rudder and skeg were redundant. Excellent for taking on the water photographs. The lower picture is of the K1XP, this is a long narrow v shaped hull with a particularly long waterline length. It is based on a marathon design with the seat well back and again straight legged position. It is the most responsive boat to edging I have tried but remarkably I found I was still able to get good on the water photos, which I find difficult in a Nordkapp Jubilee or Sirius. It is very easy to paddle fast and on rougher water in the Clyde, it pitched noticeably less than the Quest. Both boats were finished to a very high standard, easily as good as Valley and P&H. I particularly liked the K1XP, a very accessible performance kayak. Absolutely fantastic, fast and handy. 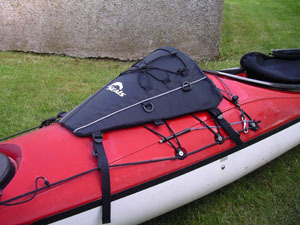 Long waterline gives a high top speed, and narrow wavepiercing ends make the canoe easily driven in all conditions. Fairly hard chines combine with high deadrise (rise of hull from keel to chine) angle to give fairly low primary stability but outstanding dynamical or secondary stability. Fairly long ‘fixed skeg’ at stern provides the best directional stability I have seen, which just makes it all a pleasure compared to many designs. Fairly high rocker facilitates turning, although it is still slow to turn unless you are proficient at edging. The rocker and stern combine to give excellent surfing downwind. Take a look at the Point 65 website. UK supplier is SPS. So what's so special about it? Well, the deck design is the first thing you notice with quite a raise forward of the cockpit. The deck lines are held in place with 'clean' fittings so no screws or bolts. The next thing you notice is the excellent seating position. The seat is low and comfortable. It comes with adjustable hip-pad options. There is a sculpted, full plate footrest on adjustable rails and secure braces for your knees. So rather than having your thighs and legs splayed out like a frog, you sit with your legs slightly raised and much more natural. But the important thing is how does it handle? This is a boat for the 21st century and it handles like a dream. Spring tides today so Penryn Mawr was running big. The ALAW just wants to move in this kind of water and move with grace. It is responsive and dynamic. You feel it keen to respond with each paddle stroke. Though it has midway chines, there's no twitching effect when you're sitting still. Rescues and rolls are performed with ease. Aled can feel justifiably proud of bringing this fantastic new boat to the sea kayaking world. I hope he gets the support from our community that he deserves. Each boat is hand made and incorporates some very forward thinking construction methods. I had a great day in his company and playing with the new boat. I will be saving up to get one but as Aled & Webby's names are on my Romany's design label I'll be keeping that one for posterity. All the best Aled and I look forward to trying the X1! 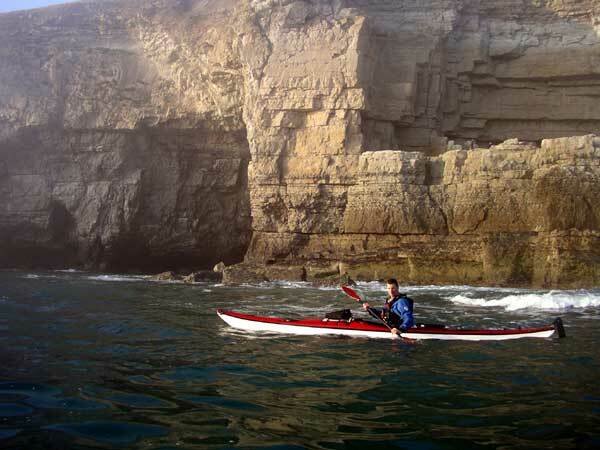 The Rockpool Kayaks website has more pictures and information. I recently managed a trip out to the Skerries with Aled using one of his boats the Alaw. ( Aled is the the owner of Rockpool Sea Kayaks and the designer of the Alaw ) Having never met Aled, I was opened minded, to if he would be on to a hard sell. Quite the opposite, he was keen for feedback and even more keen to go paddling. I have very limited knowledge of sea kayaking but have paddled 8 boats in the last 5 months so feel I can offer some views. The Alaw seemed very stable based on my time in an Explorer, Quest, Capella ( not plastic ) and an old Orca ( not plastic ) It seemed more stable than the Quest/Capella and nearly as stable as the Explorer. 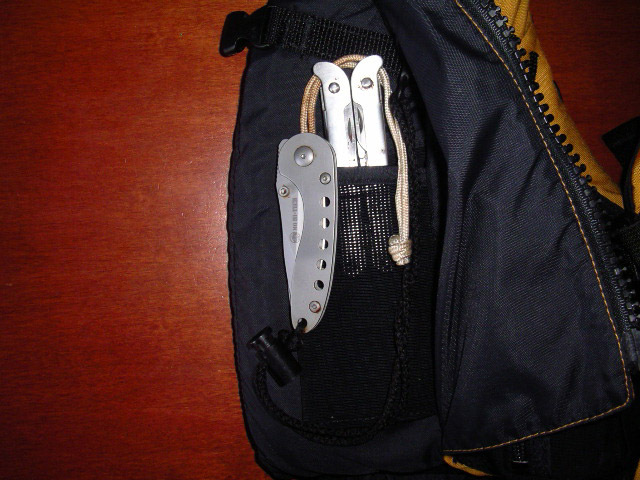 However, as expected, it was easier to turn, needing less edge to do so than the Explorer but never feeling twitchy. At first it seemed strange having such a high front deck but this was soon forgotten. The seating position for me seemed more natural and comfortable. However the leg room was a little tight. Now this is based on me being 6ft 4 and having size 13 feet. With this in mind all that needs as with other boats is the bulkhead moving. The wind was quite light and the swell was not that big in the tidal races but the Alaw was fun to paddle, did not seem to slow and had a presence compared to the other boats I had paddled. I would say that the Alaw is definitely worth a look so drop Aled a line. Would I buy one ? Well I had a boat lined up but thats on hold until I try out one without the bulkhead moved. Click here for Douglas Wilcox's impression of the Alaw Bach and here for the Alaw and Alaw Bach. This discussion also offers a variety of impressions. My first experience with an Ocean Kayak was the Ocean Kayak Yak (8ft) when I was working this summer along side the Beachguards on Great Yarmouth beach. Before then I had only kayaked in-land on fairly placid water (where I did my 1* Kayak with BCU). My first taste of the sea on one of these was quite scary especially as I tried to come back into shore and was tipped over by a wave. After a few more attempts in the water I got the hang of coming into shore without getting too wet. The local marine shop then lent the beachguards a Frenzy, which I had a go on, it was 9ft and had a deeper keel, an open cockpit, is easy to get in and make a quick exit out of. The keel makes it so easy to go straight and it cuts the water better than the smaller yak. The only problem is that the keel drags in shallow water. Being the foot longer it has the room for small children, although my 2 older children love going out on the beach guards Yaks or even my Frenzy. 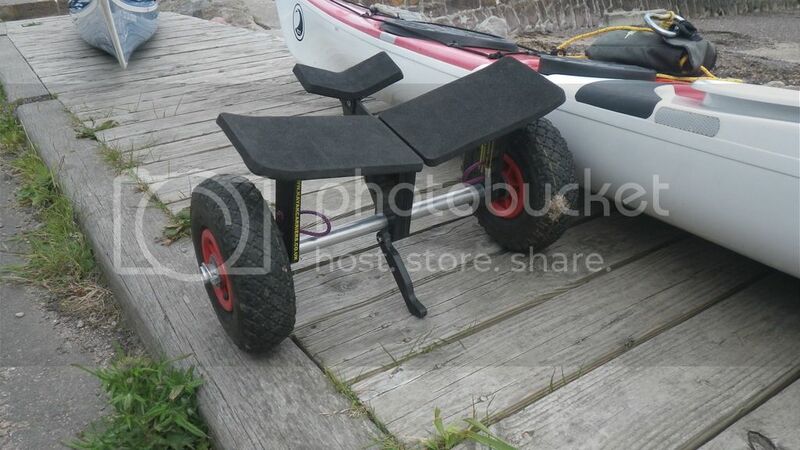 This boat is most suitable for kids or smaller people, as its Max weight capacity is only 125-147kg. So if you are heavier, you may want to consider buying one of the larger kayaks like the Scrambler. 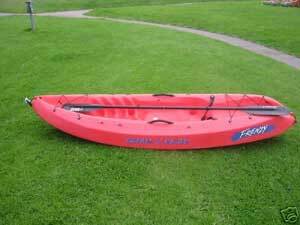 This is a great stable kayak especially for the price. for under £300. It is very comfortable with an added seat it has storage at the rear and the front with bungees. The scupper holes work great when in rough water or surfing, but you would need to get plugs for lake/calm paddling otherwise you get wet for no reason. 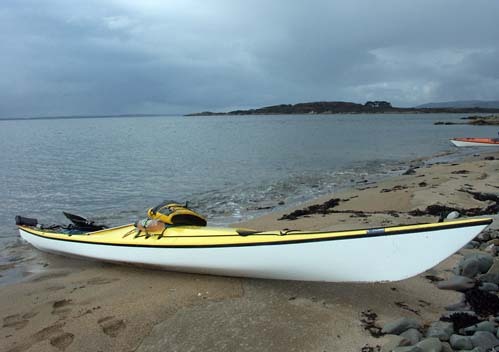 I eventually purchased my own Frenzy in August not knowing much about kayaks other than what I had learnt "hands on" and a few tips from the old sea dogs along the beach. It was the best thing ever. I certainly would suggest trying it out by either renting one or borrowing one first, it is like no other ride on water. This is a great boat for a lake, ocean, or just about everything. One bad thing is that you can really only use this in the summer or in warmer water because you will get wet (if not totally soaked) and even with the thickest wetsuit the North Sea is cold. I'd welcome any thoughts, input, ideas or suggestions either on the reviews here, or on any other kit, equipment or kayak(s) you use yourself or have seen someone else using, so please feel free to contact me if you can add to this in any way.